Michel Petrucciani was one of the most amazing pianists who took the jaza world by storm in the 1980s. His blend of Bill Evans-like lyricism and Oscar Peterson-like power and technique was utterly unique. This fascinating live recording was produced at the Montreux Jazz Festival in Switzerland. 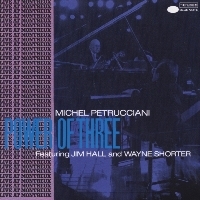 The majority of the program is performed by the duo of Petrucciani and guitarist Jim Hall who recently passed in December 2013, with three tracks performed with a very special guest Wayne Shorter on tenor and soprano sax. The interaction among these three geniuses is open, free, and utterly fascinating. A priceless record of a fantastic musical meeting. Recorded live at the Montreux Jazz Festival in Switzerland on July 14, 1986. SHM-CD uses an advanced polycarbonate material for superior sound quality and is compatible with all CD players.